Served with lumpy mash and slightly overcooked greens, this seemed super sophisticated when I was little. Well, with a garlicky, buttery middle it’s delicious still, and accordingly, sales are up 10% on last year. You can get fancy and make your own with one of our recipes. Sales are up 61% and 63% respectively on last year for these pinnacles of Seventies fine dining, and I still have a soft spot for both. Frozen scampi with peas, oven chips and salad cream is a guilty pleasure I’ll never be too old for. 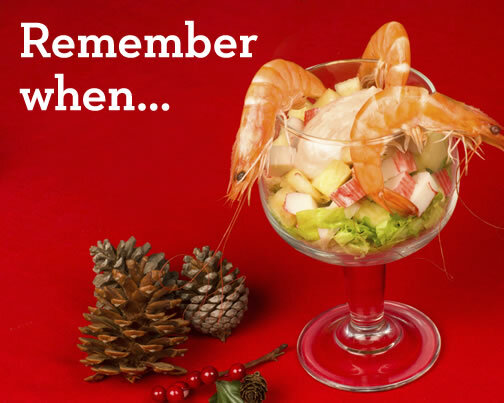 Meanwhile, Heston’s Prawn Cocktail will be daintily served up in lettuce cups or avocado halves come Christmas – I just need someone to bring the sherry. Always in the freezer for high days and holidays, there was nothing I didn’t love about sponge, ice cream and jam combined. Happy times! Sales are up 74% on last year, so I know I’m not the only one. You can’t have a party without these Marmite-y snacks; I simply refuse to allow it. Stock up for Christmas and be ten again. This entry was posted in Talking Ocado and tagged Angel Delight, Birds Eye Arctic Roll, chicken Kiev, childhood food, Cook, Cooking, cooking from scratch, Eighties, food, foodie, frozen food, frozen scampi, good food, Groceries, Heston, home cooking, nostalgia, Ocado, Ocado deliveries, Ocado groceries, ocado.com, party food, prawn cocktail, retro food, Seventies, shopping, Shopping at Ocado, throwback, TV Chef, Twiglets by Ocado. Bookmark the permalink. I so remember these foods, not when I was growing up but when I was bringing up my family. I still yearn for many of the goodies! I love Twiglets so they must be on my Christmas shopping list!!! Twiglets are that had-breakfast-ages-to-lunch period summed up in a snack – couldn’t be without on Christmas morning!